I would like to add some texture to some of my existing brush fonts. I'm wondering how designers deal with the beziers in this case. It's a lot of points and finding things like overlaps and twists is almost impossible. The file size is also a big issue. Looking at some of the highly detailed and textured fonts that have been recently released, makes me wonder if these fonts might cause issues like crashing software, printer problems. Also, what's the best way to autotrace? Any tips or opinions? Thanks for any help! Here's an example of what I'm working on. This is a close up of the points. What I've noticed is points on top of each other, shapes with only two points (I think 3 is the minimum isn't it?) and just outright wrong. You might have more luck working everything out at an extremely high UPM, doing whatever cleanup you need to do and scaling it back down to your target UPM. Trying to clean it up at a low UPM can be frustrating because you have to fight with the low resolution. When you're dealing with grunge details in low resolution, Bezier handles pop to unwanted angles or disappear. Close points overlap and general anger occurs. You'll still have to clean it up manually after scaling back down but it's not as bad. If you run the FontLab simplify filter on low resolution grunge, it can cause more problems that it solves. If you scale it up large enough, that cleanup filter can save you a lot of low-res bezier wrestling. As for the specks: beware of those 2 point shapes. You can't even leave one of those in your font or bad juju will occur. Specks are a pain and I'll often manually remove them but sometimes they're necessary. Sometimes I copy everything to the mask layer. Select everything that's not a speck, invert selection and delete. I create a couple of generic tiny circles, making sure that they're constructed in a way that allows them to be converted to TT curves with simple, single point curves. I use the mask layer as a guide and copy/paste hundreds of little round specks. It tends to ruin things but with certain textures it can really pay off. You'll still have to inspect the resulting mess but at least you're not going to have any bad curves to deal with. OTF and TTF have different breaking points. OTF is tolerant of bad curves but hates massive numbers of points and TTF is the opposite. Converting curves to straight lines might just work with what I'm working on. What I've decided to do is create an art brush with texture in illustrator. Shape the texture around the letters, then expand and minus front. I could create the brushes with straight lines only and weed out any 2 point shapes to begin with. Beziers with no arms would probably have less bytes, maybe? Thanks Ray! Oh! I saw your color font experiment, it's exciting! Just curious if anyone knows at what kb does a font file become too large and start to become buggy for TT or OT? I read something about a Chinese character font that crashes the browser when it's used. What's the tipping point number? Thanks for any help! It isn't some set size in kb, and the breakpoints depend on the rasterizer and its available memory, and how that implementation deals with things. I seem to remember in the early days of OpenType seeing some issues testing one or two of the more complex Adobe OT fonts on one or two really old PostScript output devices with very low amounts of RAM. If I recall correctly, in the end there wasn't much we could do about it and we put some note in the readme. @Jess Latham I could help you texturize all your fonts in no time for a very reasonable price. If you are interested, come and find me on Facebook (https://www.facebook.com/kateliev) send me a message and we could discuss it. @Thomas Phinney Thanks for the tip! I guess I will just put my font to the test and see how it holds up. @Vassil Kateliev I'm having too much fun to let anyone else do it, but thanks for the offer, hehe. How much time do you guys spend making a textured typeface and what is your usual workflow - for example TypeDesign program >copy> Illustrator >copy> TypeDesign program or TypeDesign program + Import Bitmap Texture + Autotrace and etc. Are you satisfied with your workflow or you find the work tedious? How long does it take you developing (lest say) a 500 character typeface, presuming that 1/2 of it is composite characters. Assuming the bitmaps are ready to go in Photoshop, I run everything through Scanfont 3.13 which autotraces the entire font in a few seconds. Then I spend an hour or two rearranging and aligning with the original non-textured typeface on the mask layer. Manual inspection and cleanup can take from a day to a week. Mochon took about an hour to go from Photoshop to font and about 3 days of manual cleanup and testing. I'm not including spacing. classes, kerning and OpenType coding. Uchiyama was about a 5 day cleanup job. It's not really textured though. It was mainly as matter of trying to get proper curves and extrema and getting rid of nasty bits. Ebenezer probably took 3 hours to go from Photoshop to completed font. The character set is much smaller so speed things up. The cleanup part is tedious. FontLab's cleanup filters weren't designed for cleaning up grunge. In the early punk days (lol) I always just autoscanned and thought nothing else about it. It was freeware and if it didn't work, well, so what. When I finish my latest textured font I'll give a run down of the process and how long it takes me. 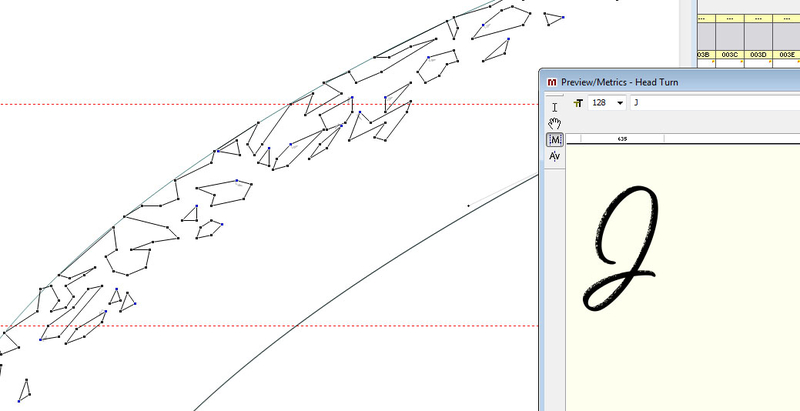 There is a good script for removing points on top of each other in Illustrator. (Remove Redundant Points). You should use that before moving your shapes. I used to keep a copy of CS2 on my machine specifically for expanding brushes etc. because it did such a better job than all later versions (including CC). When you hit the shape with 'unite' in the Illustrator pathfinder, that gets rid of overlaps. As promised, here is the process of how I textured my last font and how long it took. My main goal was just to see if I could texture a font heavily and have it pass Fontlab's font audit. There were 286 characters not counting composites. In Illustrator I typed out about 5 letters at a time and a bar character that I had created to keep the complete height of everything. Took the art brush I had created of basically squareish specks and shaped them around the strokes, leaving a side that was smooth to keep the file size down. Clean up until all the arrows disappeared with font audit. This was very tedious and a test of self discipline, lol. What I noticed is that if I ever saw a red arrow with audit on that said "Move is empty" when I drew a plain square box, there was a single point hiding somewhere. Not sure how I found this out but it was helpful. That was a very basic rundown, there were lots of steps in between. I logged my hours (forgot a couple of times) and it took about 60 hours, so about 12 minutes per character. 466 characters total and the file size: 986kb for the truetype and 675kb for the postscript. I thought that was excellent. I really liked the finished product, it reminds me of a grease pencil. If I texture another one I will make the texture less detailed and enlarge it so that it is more pronounced at smaller sizes but I wanted to push the limits on this one. The font has done ok at FontSpring: https://www.fontspring.com/tag/script it's currently on the first page of script fonts, close to the top, not sure how accurate that algorithm is. MyFonts was unfortunately having technical issues and I was not able to release it there until 3 months later. It didn't chart at all and sold very few copies early on. Possibly because the amount of fonts in the new section at the time was more than average and pushed it down the list faster. It has picked up a little momentum since then. MyFonts was unfortunately having technical issues and I was not able to release it there until 3 months later. It didn't chart at all and sold very few copies early on. Possibly because the amount of fonts in the new section at the time was more than average and pushed it down the list faster. It has picked up a little momentum since then. Polygons are the way to go with textures, they are both too small to see and very forgiving on the file size. When we did our bestseller Nexa Rusted, every glyph went through my hands so it can get less detailed and more light. I had to also care that no grunge touches the contour, because there was also a solid version. When we did our bestseller Nexa Rusted, every glyph went through my hands so it can get less detailed and more light. I had to also care that no grunge touches the contour, because there was also a solid version. Nexa Rust has amazing texture. How many hours do you think it took to add texture to the whole family? My collegue at the time, Tinkov (currently N1 in MyFonts bestsellers), came up with an A. Illustrator Technique for that (asphalt texture+threshold+inner glow or shadow to isolate the edges. Then auto-trace. This is as far as I remember) . After that it was a simple matter of cleaning up the edges. I have noted every hour of my work there, but the notes are buried somewhere in the boxes while moving. It gave me a sense of control, but it was a false feeling. Currently my namesake Kataliev has a good programming way to roughen a font, and he has used it for his font families. My personal opinion is that textured fonts are (came to be) just a trend, but the technology is now goodly developed. It took me tens of man-hours, I imagine. I do not do such statistics any more.